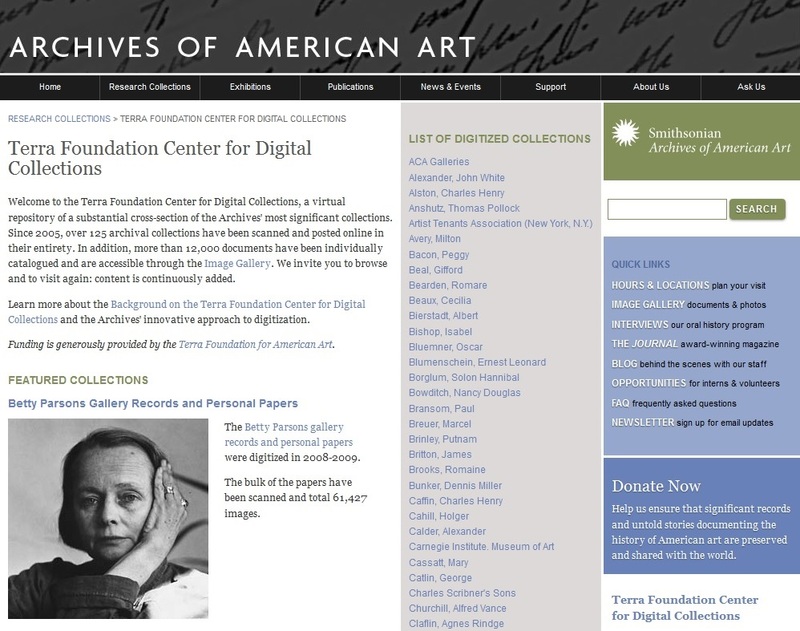 Homepage of the Terra Foundation Center for Digital Collections at the Archives of American Art. The Smithsonian’s Archives of American Art and the Chicago-based Terra Foundation for American Art announced a long-term partnership to support the digitization of the Archives’ collections. The Terra Foundation has made a $4.5 million commitment to the Archives, $4 million of which is a challenge grant to be matched by the Smithsonian, to seed an endowment for ongoing digitization. The remaining $500,000 provides operating support for the current digitization program. The Archives of American Art holds nearly 6,000 collections of archival material on the artists, collectors, dealers, and scholars who have shaped the history of art in America. Its oral history program, containing interviews with important artists ranging from Charles Burchfield to Kehinde Wiley, has preserved the voices and personal stories of nearly 2,300 art world luminaries since 1958. Transcripts for many of these are available on the Archives’ website. Since the inception of its digitization program in 2004, with support from the Terra Foundation, the Archives has created more than 2 million digital images that together represent full online access to more than 160 of its most important collections, including the papers of art-world luminaries such as Milton Avery, Joseph Cornell, Lee Krasner, Horace Pippin, Jackson Pollock, and Grant Wood, among many others. As the program has grown, visitation to the Archives’ ever-expanding collections has increased from about 2,000 users a year via its reading rooms and inter-library loan program for its microfilm to more than 500,000 users a year, with the vast majority visiting online. Founded in 1954, the Archives of American Art fosters advanced research through the accumulation and dissemination of primary sources, unequaled in historical depth and breadth, that document more than 200 years of the nation’s artists and art communities. The Archives provides access to these materials through its exhibitions and publications, including the Archives of American Art Journal, the longest-running scholarly journal in the field of American art. An international leader in the digitizing of archival collections, the Archives also makes more than two million digital images freely available online. The oral history collection includes more than 2,200 audio interviews, the largest accumulation of in-depth, first-person accounts of the American art world. Established in 1978, the Terra Foundation for American Art is dedicated to fostering the exploration, understanding, and enjoyment of the visual arts of the United States. With financial resources of more than $350 million, an exceptional collection of American art from the colonial period to 1945, and an expansive grant program, it is one of the leading foundations focused on American art, supporting exhibitions, academic programs, and research worldwide. Since 2005, the Terra Foundation has provided more than $70 million for approximately 700 exhibitions and education and scholarly programs in more than 30 countries, including Brazil, China, Israel, Russia, South Korea, Sweden, and the United Kingdom.